Yes Response is pleased to announce that we have taken delivery of a shrink wrapping machine. This extends our service offering and complements our existing comprehensive range of collation, fulfilment and mailing services. The machine will enable us to shrink wrap DVD cases and literature. This new service is a great environmentally friendly and cost-effective way to protect DVDs, literature or other items, with the additional benefit of being tamper-proof. So if you have a requirement for shrink wrapping, please contact us. 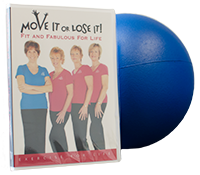 Yes Response Limited are continuing their relationship with Move It or Lose It and are now storing the full range of 4 workout DVDs and accessories for the company, including the newly launched fourth DVD and an exercise ball. Move It or Lose It’s DVDs are specifically designed for older or less mobile people who want to continue to stay fit and active at home. Yes Response have been working with Move It or Lose It to facilitate the distribution of these exercise routine DVDs with orders received via phone, online orders or by mail order. Sales of the 4th DVD are predicted to be at least 3,000 units over the first 6 weeks. As before, these orders will be received via a variety of channels, and will be despatched by Yes Response the same day. We pride ourselves on our commitment to offering our customers this fast fulfillment service – a guaranteed service level promise that we started right from day one, when we began trading 18 years ago. In today’s fast-moving world, this has becoming increasingly important, but we remember the days when mail order companies would promise delivery within 28 days! Things have changed a lot since then, but Yes Response have always aimed to despatch all orders for our clients the same day to get products to customers as quickly as possible. The postal system has been going through significant changes over the last few years, with more changes still set to come. For instance, since its start in 2004, access mail (mail that it collected and distributed by a competitor, but is passed on to Royal Mail for final processing and despatch to local delivery offices) has grown rapidly. In 2005 there were 786 million items mailed via access routes – by 2011 this had grown to 7.24 billion items. And it looks like this figure is still set to rise. Are these mail items getting to customers on time though? Well, in the latest Quality of Service performances figures published by Royal Mail, it seems that 92.2% of First Class mail is delivered next day, 98.6% of Second Class mail is delivered within three working days, 96.3% of retail parcels are delivered within three working days and 94.2% of access mail is delivered the first working day after receipt by Royal Mail. With these figures based on the period 25 June 2012 to 23 September 2012. There are also plans to simplify the parcel services from April 2013. There are currently up to 15 different weight bands for parcels – the plans are to decrease this to just 7. This should make it much easier to understand and choose the most appropriate service. The changes also include the introduction of two broad parcel categories – small parcels and medium parcels. This will bring Royal Mail’s categorisation in line with many other postal operators within Europe. New figures now reveal that UK consumers receive more parcels than anyone else. The Ofcom International Communications Market Report 2012 showed that 34% of UK consumers claimed to have received at least one large parcel (an item that does not fit through the letterbox) within the past month – a figure that is higher than any other country that was involved in the survey. Despite the increasing costs of postage with Royal Mail, the Ofcom report also showed that when it comes to standard-sized letters, the UK is among the cheapest in Europe. For small letters, however, the UK and Japan are the most expensive countries. Yes Response spotted a great article in the Financial Times recently. Robert Shrimsley discusses the role of fulfilment centres in online purchasing. We thought that this was a very accurate description of the fulfilment services offered by Yes Response (especially the part about elves singing merry songs!). It’s a great article and we highly recommend visiting FT.com to read it. Yes Response would like to wish all of our clients, suppliers, friends and advisers a very happy and prosperous 2013. For those of you that we’ve not yet seen this year, we look forward to seeing you soon and we especially look forward to welcoming those of you who have not yet visited our new premises, The Hub.